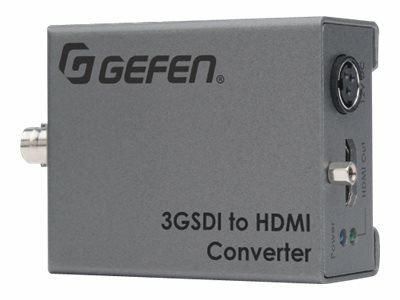 The Gefen EXT-3G-HD-C converts audio and video from SDI to HDMI format, at resolutions up to 1080p Full HD. 3G-SDI, single link HD-SDI, and audio formats up to 8 channels of LPCM are supported. The Gefen EXT-3G-HD-C's compact enclosure, while light enough to be held in place using double sided Velcro tape, features an ISO standard 1/4-20 attachment provision as well as a detachable surface-mounting bracket. This, along with a flexible power input circuitry capable of accepting a wide range of DC voltages and a locking power supply connector, make the EXT-3G-HD-C ideal for cutting edge mobile A/V applications as well as high performance fixed installations.